Drolly is made with an ORIGINAL 1956 Drolly head! Hermann - Spielwaren GmbH, Coburg, Germany. 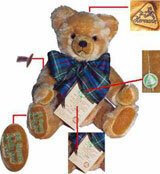 Drolly Bear is made with an original old Drolly head from the year 1956. Mohair teddy bear with original 1956 rubber head. Size: 24 cm, 9.5 inches tall. Made in Germany - Hergestellt in Deutschland. Hermann 10200-5.